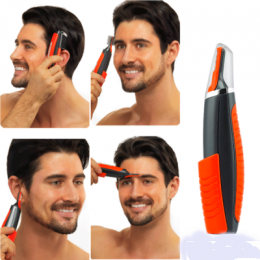 This 2 in 1 Male Shaver has a full size blade that will help keep your beard or sideburns trim and neat. This trimmer is a head to toe full body grooming tool. You can also use to trim your frontal or back hairline. It gets the job done without causing injuries, or irritating your delicate skin in any way. Powerful enough for providing a clean shave but gentle enough for the most sensitive skin. Material: ABS+ stainless steel blade. Power supply: 2*AAA battery(not included).